Crates provide a safe, den-like space for your puppy. It’s a good idea to work on crate training for short periods throughout the day by rewarding your puppy with high value treats whenever he or she is introduced into the crate. Eventually, your puppy will be happy in their crate at night. Crate training will also make housebreaking easier. It’s important to choose a crate that provides good airflow, is large enough for your puppy to get up and easily turn around, and has a crate mat that makes the space comfortable. Placing the crate in or near your bedroom will help reduce your puppy’s anxiety. Dogs are social animals and usually like sleeping near the rest of the pack. Need more hints? The AKC provides a presentation that filled with great tips that you can check out here. Just like children, a nighttime routine can help your puppy wind down and prepare for bed. Light exercise an hour or two before their bedtime will help to tire them out. This should be followed by quiet time (but no napping!) Your puppy should also have a bathroom break, right before bed. Initially, puppies might cry because they miss their mom and siblings. Providing a towel or shirt that has the sent of the mom can help. Alternatively, there are plush toys that feature the sound of a beating heart (such as the Snuggle Puppy) that are designed to help comfort your puppy. Classical music has been found to help dogs relax. 4) Do They Need To Go To The Bathroom? Another reason your puppy could be crying is because they need to go to the bathroom! 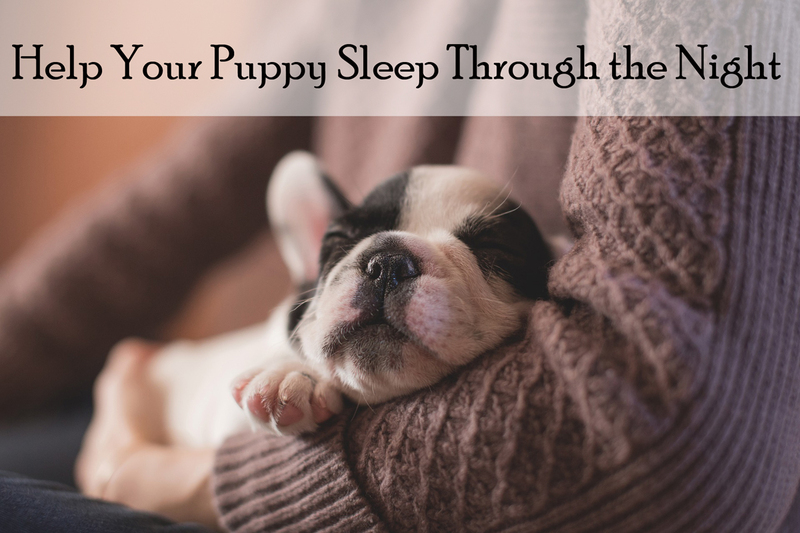 Most puppies will not soil where they sleep and a good rule of thumb for how long a puppy can hold their bladder is their age in months plus one (i.e., a four month old puppy will likely be able to hold their bladder for five hours…this means even at night!). With a bit of patience, your puppy will become used to their bedtime routine and everyone will have a peaceful night’s rest. ← Puppy Month: Why does my puppy bark (and what to do about it)?